EZ-Lok Cable Seals are durable cable security seals featuring non-preformed security cables that fray when cut. 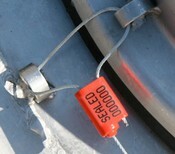 Our Cable Seals provide you with the measured security you need. 1/16" EZ-Lok Cable Seals are approved by the sweetner industry for bulk truck and rail car shipments.